Upside banana bread is a fun twist on traditional banana bread recipe. 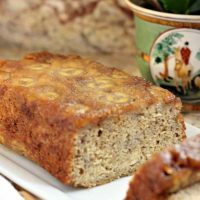 Bananas and sugar bake with butter on the bottom layer of this bread recipe and create a roasted banana topping that provides moisture and depth of flavor. 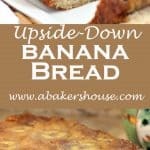 Upside down banana bread is an easy twist to the usual banana bread. You may have heard of upside down pineapple cake or this upside peach cake that is perfect for fresh summer peaches but have you tried the same technique with bananas? Adding brown sugar and melted butter to the bottom of the loaf pan then letting some bananas soak up that caramel-gooey goodness really makes this a special way to bake banana bread. 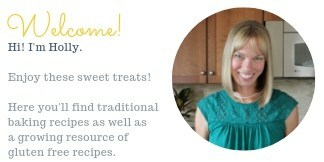 If you love banana recipes, you’ll enjoy gluten free banana muffins, toffee banana bread, and banana oatmeal cookies. I first saw the idea on The Daring Gourmet’s site. She adds an extra caramel glaze at the end that looks SO GOOD as a scrumptious dessert. I omitted that step if only to convince myself that this was a bread for breakfast, snacking, and to serve with a cup of afternoon tea. But, oh, how I want to try that caramel sauce another time for sure. Summer is in full swing and flying by. When school ended in early June for my boys it seemed that we had an endless stretch of days in front of us to enjoy the summer of 2014. We’ve already visited my family in Pennsylvania, spent time at the pool, gone golfing a few times a week, and all of the sudden June has disappeared. All of this activity means less time to bake and blog but that is ok, I’ll get back into the swing of more frequent posts this fall. I didn’t want to miss this monthly bread baking group post for #TwelveLoaves so I found a quick and easy way to spruce up my usual banana bread recipe. The bakers of #TwelveLoaves are going with the flow this month and baking any type of bread we’d like and we hope you’ll do the same. SUMMER FUN is the theme so find a bread that makes your summer days happy and delicious then share your creation with us here. The FUN in this banana bread is that sweet topping that starts on the bottom of the pan and ends up as your topping. My son thought it was great when I flipped the loaf pan over and out came the surprise of an upside down treat. Sprinkle 3 Tablespoons brown sugar and 2 Tablespoons butter into your loaf pan. Place into a 350 degree oven for 10 minutes. Remove the pan and carefully swirl the melted butter and brown sugar together. Gently lay the sliced bananas into the pan. Spray the sides of the pan with baking spray. Combine the buttermilk, canola oil, rum, and eggs in a large mixing bowl. Set aside. Mix the flour, baking soda, and salt in a separate bowl. Add the dry ingredients to the wet ingredients and stir until barely combined. In a small bowl mash the bananas with the 1/3 cup brown sugar. Add this mixture to the bread batter by folding together with a large spoon or spatula. Do not over mix the batter. Pour the batter over top of the sliced bananas in the loaf pan. Bake for 50-60 minutes at 350 degrees F.
Cool for 5-10 minutes in the pan then turn the loaf pan over onto a serving plate. The Upside Down Layer is an idea I saw on The Daring Gourmet. #TwelveLoaves runs smoothly with the help of our friends. Thank you to Stacy Livingston Rushton for hosting this month’s event! What a great idea, Holly! I love that sticky, toffeeish banana bottom. I mean, top. This would be a popular loaf at our house. Best banana bread I’ve seen in a long time. Love the way those banana slices look on the top of the bread. Awesome. Holly your bread looks scrumptious! 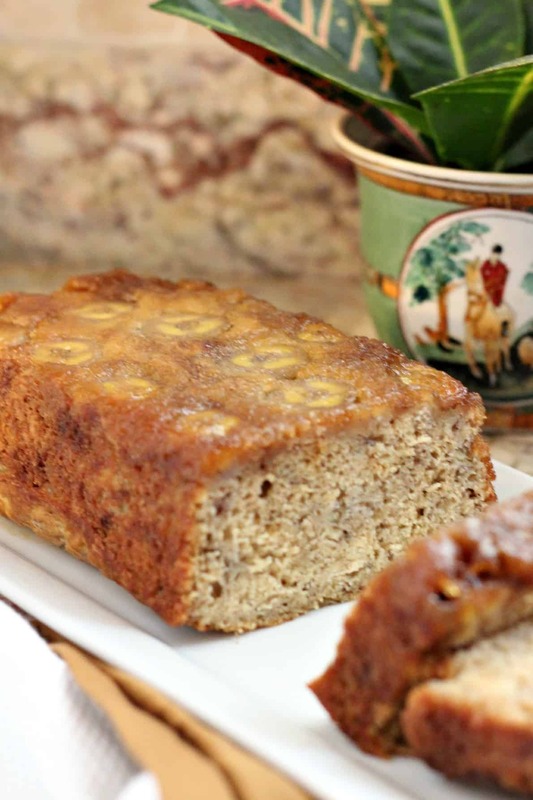 I love banana bread but this one is just simply one step beyond! Love it. I would have never thought to use bananas this way. But your pictures are proving that they can hold up and look delicious when turned over. Nice job! Holly, that takes banana bread to a whole new level!!! Yum!! I think it’s great when you flip it over, too! Great recipe, Holly. and what a great summer. Happy 4th! I’m not usually one to say so, but “where did June go”? A think a vacation can take up so much time due to the planning and catching up before and after. We were gone too and I’m surprised it’s already July. This bread looks good Holly. I love a good banana bread and love this idea. Have a great holiday weekend. I can imagine how great this loaf tastes with that yummy topping! Great bread recipe, Holly! I feel the same way about summer! It goes by so quickly and I think, in the fall…my blog will have more of me;)Gorgeous banana bread. How nice would it be with my coffee right now!! It would be helpful if you indicated the pan size on this one. I’m guessing 9×5 but not sure. The 8×4 might be a bit small but then if that is what you used and I use a 9×5 it would make the loaf thinner than it might be intended. I really can’t wait to try this one. Never seen one that uses less ripe bananas as a topper (bottom?? LOL). Really a marvelous and clever idea. Thanks for the recipe!! WOW!!! This was the best banana bread I ever made. DELICIOUS!!!! I had 4 banana’s that died on top of the refrigerator, they were so over ripe they were solid black. And this recipe was exactly what I needed. I never measured the banana’s after I mashed them, but it must have been the perfect amount as this banana bread had such a strong banana flavor it didn’t last 24 hours in our house. I also added a 1/2 cup of chopped pecans. Thanks for posting I’ll be making this quite often from now on!!! Oh I have four bananas ready to use today– thanks for the reminder of this great banana bread recipe!